A quick google search of “photoshop tutorials” yields million of results — everything from how to crop out an image’s background to the best way to create a portrait of aliens battling in space. Even if you don’t directly use Photoshop, it’s guaranteed your life on the daily is impacted by its work — through movie posters, photo editing and maybe even societal perceptions of beauty and the human body. This weekend the creators and engineers behind Adobe’s Photoshop won an Oscar awarded by the chair of the Scientific and Technical Awards committee at the Academic of Motion Picture Arts and Sciences, the other half to the Academy’s annual ceremony. Developed by brother John and Thomas Knoll, the program was initially built when John worked at Industrial Light & Magic, the special effects company behind blockbusters such as “Star Wars,” “Jurassic Park” and “The Mummy.” Which makes sense since what is film but a bunch of movie images that have been edited? Unlike the glitzy traditional Academy Awards, these Oscars are awarded to the people behind the technology which has made a substantial impact on how films are made, according to Doug Roble, the chair of the Scientific and Technical Awards Committee. And it turns out Photoshop — the graphic designer’s best friend — made a substantial impact on the cinematic world. “The Abyss” was one of the first films to use Photoshop. Water tentacles of the deep sea monster in the film (spoiler alert: yes, in “The Abyss,” there is in fact a monster) were built using the early computer rendering the program provided. All of that started in 1990. 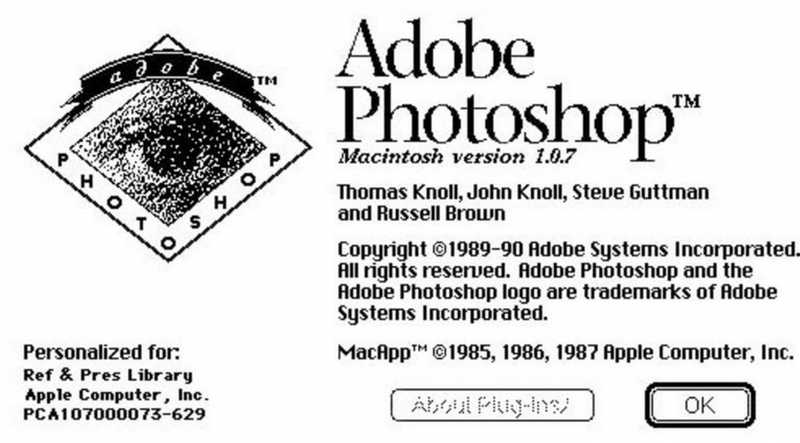 Known initially as Display, and then Photoshop 1.0, first versions of the program were devoid of now classic tools and actions such as layers and undo. The interface was black and white. A sample tutorial John Knoll would show off was a mere 24 bits. Today, according to Adobe, over 90 percent of creative professionals use Photoshop in their line of work. When asked recently, John Knoll said that when he invented it, he didn’t have much of an idea as to what type of impact Photoshop would have on the greater graphics world. In an interview with Digital Spy he said he only expected to only sell about 500 copies of the application a month.